Spatial Information Management for Sustainable Real Estate Markets and Best Practice Guidelines on Nation-wide Land Administration. Capacity building is increasingly seen as a key component of land administration projects in developing or transition countries undertaken by the World Bank and individual country development assistance agencies. However, the capacity building concept is often used within a narrow meaning such as focusing on staff development through formal education and training programmes to meet the lack of qualified personnel in the short term. In fact, capacity building is often used as a synonym for human resource development. This paper argues that even if the key focus may be on education and training to meet short and medium term needs, capacity building measures should be addressed in the wider context of developing institutional infrastructures for implementing land policies in a sustainable way. Capacity building measures must be addressed at three levels: the societal level (policies, legal frameworks and accountability), the organisational level (institutional infrastructures and organisational effectiveness), and individual level (technical and professional competencies and responsibilities). Capacity building should be seen as a comprehensive methodology aiming to provide a sustainable outcome through assessing and addressing a whole range of relevant issues and their interrelationships. This paper aims to develop the capacity building concept to provide some guidance in the area of introducing sustainable land administration infrastructures. The paper also analyses the complex and interdisciplinary nature of the land administration paradigm in order to identify the key issues to be addressed. The paper then discusses the future directions towards developing methodological guidelines for capacity building in land administration. In most developing and transition countries there is a lack of institutional capacity to address land administration issues in an adequate and sustainable way. Many donor projects have been established to respond to these problems. However, responding to these problems is not simple. This is partly due to the complex nature of the land administration paradigm, and partly due to the lack of emphasis on long-term capacity building measures towards developing sustainable institutional infrastructures. It is generally understood that security of land tenure, efficiency of land markets, and effectiveness of land use control are crucial components in any land policy. The activities relies on some form of land administration infrastructure which permits the complex range of rights, restrictions and responsibilities to be identified, mapped and managed as a basis for policy formulation and implementation. There are two key aspects in building such land administration infrastructures: first the establishment of the appropriate land administration system itself; and secondly ensuring that there is a sustainable long-term capacity of educated and trained personnel to operate the system in both the public and private sectors. In many developing and transition countries this second aspect of human resource development is the weakest link. Another weakness is the lack of emphasis on building sustainable institutional infrastructures with clear responsibilities of governance. When a project is established to create land administration infrastructures, often with the support of organisations such as the World Bank, the United Nations or individual country aid agencies, it is critical that capacity building is a mainstream component of the project. The capacity building aspect should be addressed up front, not as an add-on. In this context there is a whole range of capacity building and human resource development principles and options to be considered. Capacity building in land administration is a complex issue. This article offers a conceptual understanding and some guiding principles when working in this area. The term capacity has many different meanings and interpretations depending on who uses it and in what context. To begin with, capacity building as a concept is closely related to education, training and human resource development. This conventional concept has changed over recent years towards a broader and more holistic view, covering both institutional and country base initiatives. The workshop on Capacity Building in Land Administration for Developing Countries, held at ITC, The Netherlands, November 2000 (Groot and van der Molen 2000) adopted the following definition on capacity building: “The development of knowledge, skills and attitudes in individuals and groups of people relevant in design, development, management and maintenance of institutional and operational infrastructures and processes that are locally meaningful”. This is a broader approach while still focusing mainly on staff development. It can be argued that the concept of Capacity Building should be viewed in a wider context to include the ways and means by which the overall goals are achieved. In the case of Land Administration, education and staff development may certainly be one of these means. However, development of institutional infrastructures (including issues such as good governance, decentralisation, and public participation) may be even more important. Also, the adoption of an adequate land policy framework may be the key to get anywhere at all. It can be argued that even if the key focus is on education and training to meet short and medium term needs, capacity building measures should be assessed in a the wider context of implementing land policies in a sustainable way. A recent UN publication on Capacity Assessment and Development (UNDP, 1998) offers this basic definition: “Capacity can be defined as the ability of individuals and organizations or organizational units to perform functions effectively, efficiently and sustainably.” This definition has three important aspects: (i) it indicates that capacity is not a passive state but is part of a continuing process; (ii) ensures that human resources and the way in which they are utilized are central to capacity development; and (iii) it requires that the overall context within which organizations undertake their functions will also be a key consideration in strategies for capacity development. Capacity is the power of something – a system, and organisation, a person, to perform and produce properly. In this UNDP context, capacity is seen as two-dimensional: Capacity Assessment and Capacity Development. Capacity Assessment or diagnosis is an essential basis for the formulation of coherent strategies for capacity development. This is a structured and analytical process whereby the various dimensions of capacity are assessed within the broader systems context, as well as evaluated for specific entities and individuals within the system. Capacity Development is a concept which is broader than institutional development since it includes an emphasis on the overall system, environment and context within which individuals, organisations and societies operate and interact. Even if the focus of concern is a specific capacity of an organization to perform a particular function, there must nevertheless always be a consideration of the overall policy environment and the coherence of specific actions with macro-level conditions. Capacity development does not, of course, imply that there is no capacity in existence; it also includes retaining and strengthening existing capacities of people and organisations to perform their tasks. The OECD has defined Capacity Development as “… the process by which individuals, groups, organisations, institutions and societies increase their abilities to: (i) perform core functions, solve problems, define and achieve objectives; and (ii) understand and deal with their development needs in a broad context and in a sustainable manner.” This definition is adopted by various donors and is fully in line with the UN definition of capacity above. Taking this approach, capacity, as such, is seen as a development outcome in itself and distinct from other programme outcomes such as technical and professional competence in certain fields. Measures such as education and training becomes a means to an end while the end itself is the capacity to achieve the identified development objectives over time - such as to establish and maintain national land administration infrastructures for sustainable development (Enemark, 2002). The previous section has defined the broad concept of capacity building. However, there is an acceptance that capacity building is a much more complex activity which can be reviewed at different levels which may include different dimensions. The highest level within which capacity initiatives may be cast is the system or enabling environment level. For development initiatives that are national in context the system would cover the entire country or society and all subcomponents that are involved. For initiatives at a sectoral level, the system would include only those components that are relevant. The dimensions of capacity at systems level may include a number of areas such as policies, legal/regulatory framework, management and accountability perspective, and the resources available. An entity may be a formal organisation such as government or one of its departments or agencies, a private sector operation, or an informal organisation such as a community based or volunteer organisation. At this level, successful methodologies examine all dimensions of capacity, including its interactions within the system, other entities, stakeholders, and clients. The dimension of capacity at the entity level should include areas such as mission and strategy, culture and competencies, processes, resources (human, financial and information resources), and infrastructure. This level addresses the need for individuals to function efficiently and effectively within the entity and within the broader system. Human Resource Development (HRD) is about assessing the capacity needs and addressing the gaps through adequate measures of education and training. Capacity assessment and development at this third level is considered the most critical. The dimension of capacity at the individual level will include the design of educational and training programs and courses to meet the identified gaps within the skills base and number of qualified staff to operate the systems. Strategies for capacity assessment and development can be focused on any level, but it is crucial that strategies are formulated on the basis of a sound analysis of all relevant dimensions. It should also be noted that the entry point for capacity analysis and development might vary according to the major focus point of the project. However, it is important to understand that capacity building is not a linear process. Whatever is the entry point and whatever is the issue currently in focus, there may be a need to zoom-in or zoom out in order to look at the conditions and consequences at the upper or lower level(s). Capacity building should be seen as a comprehensive methodology aiming to provide a sustainable outcome through assessing and addressing a whole range of relevant issues and their interrelationships. E.g. capacity building is crucial to enable proper interaction between actors, to increase commitment and to over come patronage. Land administration systems are concerned with the social, legal, economic and technical framework within which land managers and administrators must operate (UN-ECE, 1996). 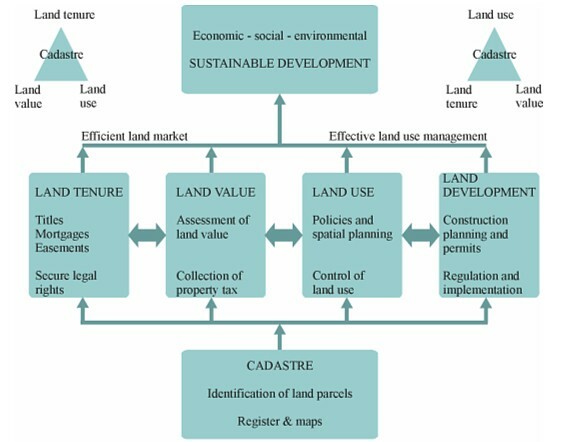 Such a global approach to land administration systems is shown in the diagram figure 1. Land Tenure: the allocation and security of rights in lands; the legal surveys to determine the parcel boundaries; the transfer of property or use from one party to another through sale or lease; and the adjudication of doubts and disputes regarding rights and parcel boundaries. Land Value: the assessment of the value of land and properties; the gathering of revenues through taxation; and the adjudication of land valuation and taxation disputes. Land Use: the control of land use through planning policies, regulations and enforcement; the implementation of construction planning through granting of permits; and the adjudication of land use conflicts. Figure 1. A Global Land Administration Perspective (Enemark, 2001). The design of adequate systems in the area of Land Tenure and Land Value should lead to the establishment of an efficient land market; and the design of adequate systems in the areas of Land-Use Control and Land Development should lead to an effective land-use administration. The combination of an efficient land market and an effective land-use administration should then form the basis for a sustainable approach to economic, social and environmental development. Within this paper, land administration is defined as the processes of determining, recording and disseminating information about tenure value and use of land implementing land policies (UN-ECE, 1996). It is considered to include a core parcel based cadastral and land registration component, multi-purposed cadastres and/or land information systems, and in many systems facilitates or includes information on land use planning and valuation/land taxation systems – although land administration does not usually include the actual land use planning and land valuation processes. Land administration systems, and particularly their core cadastral components, are an important infrastructure, which facilitates the implementation of land policies in both developed and developing countries (UN/FIG 1999). These systems are concerned with the administration of land as a natural resource to ensure its sustainable development. The cadastral identification of land parcels permeates through the land administration and land management systems and provides the basic infrastructure for running the interrelated systems within the areas of Land Tenure, Land Value, and Land Use. As a result, the traditional surveying, mapping and land registration focus have moved away from being primarily provider-driven to now being clearly user-driven. The modern land administration system is concerned with detailed information at the individual land parcel level. As such it should service the needs of both the individual and the community at large. The system, this way, acts as a kind of backbone in society. Benefits arise through its application to e.g. : guarantee of ownership and security of tenure and credit; facilitate efficient land transfers and land markets; support management of assets; and provide basic information in processes of physical planning, land development and environmental control. In short, benefits arise through cadastral applications for land management in general. Throughout the world, the cadastral concept has developed significantly over the past few decades. The most recent examples are current world concerns of environmental management, sustainable development and social justice. Due to this, multi-purpose cadastres are increasingly seen as fundamental to economic development, environmental management and social stability in both the developed and developing worlds (Williamson, 2001a). The Bathurst Declaration (UN/FIG, 1999) established a powerful link between appropriate land administration and sustainable development. This should also be seen as a result of the gradual evolution of land administration systems over time towards a more managerial and multi-purpose role. This multi-purpose role should provide adequate spatial information infrastructures as a basis for sustainable decision making in all land related matters. Sustainable development is not attainable without sound land administration. This demand for sound land administration infrastructures also requires support from a well-developed spatial information infrastructure for sharing geo-referenced information. This includes the need to adequately address conceptual and policy issues such as data access, intellectual property, cost recovery, and design of an efficient institutional framework. The three levels of capacity building (the system, the entity, and the individual level) can be considered in the context of land administration systems as follows. Land Administration is very much about systems and processes – cadastral systems, land registration systems, valuation and taxation systems, planning control systems, and the embedded processes to carry out the tasks. The purpose of the systems is to build, identify and ensure land rights; to build efficient land markets; and to ensure effective and sustainable management of the use of land. Land Administration is embedded in an overall land policy and the connected legal framework. This is the broader system/societal level. Secondly, Land Administration is about building infrastructures in terms of efficient relations between the systems, and in terms of an efficient national spatial data infrastructure. Building infrastructures is also about developing administrative policies and good governance. It is about building “capable government”, able to perform key functions effectively and based on trust and clearly defined responsibilities. This the organisational level. Thirdly, Land Administration is about people – from politicians, senior professionals and managers, middle managers and administrators, to office and field personnel, - whether in public or private sector. At the senior level a broad vision and understanding is required. At the more practical level the players in the system need to have some understanding of the overall system but will have much more detailed and specific skills that need to be developed. This is the individual level. Land Administration is a cross-sectoral and multi-disciplinary area. It includes, technical, legal, managerial and institutional dimensions. An adequate response in terms of capacity building measures must reflect this basic characteristic. However, the relationship of humankind to land determines the form of land administration response. This relationship is dynamic and driven by global drivers such technology development, micro economic reform, urbanisation, globalisation, and sustainable development. The relationship of humankind to land varies in and between countries and regions, and adequate responses in terms of capacity building must reflect these fundamental conditions. For example, if a country such as Indonesia wished to have a land administration system supported by a land title and cadastral surveying system similar to Denmark or Australia, this could possibly require 40,000 professional land surveyors and 30 or more university programs educating professional surveyors (based on Steudler et. al., 1997). Clearly this is not realistic even in a medium term perspective. As a result, there is a need to develop appropriate solutions matching the stage of development and specific characteristics and requirements of the individual country. The FAO Land Tenure Service in Rome has established a project on developing methodological guidelines on education and training strategies for strengthening the human capital needed for improved land tenure policies and land administration. The project is facing the widely stated problem of poor institutional capacity of land administration agencies in many developing and transition countries. Responding to this problem has not been simple for many reasons. In many cases, land administration agencies are under-resourced: large number of posts may be unfilled and those land administrators in service are often under-paid compared with the private sector, lack of equipment to do their job properly, and often lack of necessary technical and managerial skills. In short, the challenges in building capacity in land administration are immense. As part of its work programme for 2002, the Land Tenure Service of the Rural Development Division has prepared a study that aims at providing guidance to countries on how to develop feasible and needed strategies for capacity building in land administration. To serve as a base, studies have been prepared on capacity building in Africa, Asia and Central and Eastern Europe. The case studies formed the basis for a workshop held 14-15 November 2002 at the FAO Headquarters in Rome. The objective of the workshop was to first review the studies and take stock of the lessons learned, and then look forward by planning the development of methodological guidelines in this area. This work will be will be carried out in 2003 and the guidelines will be published in the FAO Land Tenure Studies Series. The FIG has established a joint working group with members from commission 2 and 7 to address the issue of capacity building in land Management. The working group is chaired by Professor Ulf Jensen, Lund University in Sweden. The working group may be seen as a follow-up on the workshop on Capacity Building in Land Administration for Developing Countries held at ITC, Enchede, The Netherlands 12-15 November 2000. The working group has developed a model to guide the work. The model is looking at capacity analysis to identify required quantity and quality; functions regarding the land markets, credit markets and users needs; managerial issues such as cost recovery, IT policies, and public/private partnerships; and operational issues such as process management, IT-modelling, staffing, and infrastructures. When this guide for capacity assessment is developed, the working group will make a test in a developing and a transition country. Arguably, many donor projects in land administration over the last decade have a rather narrow focus on access to land and security of land tenure. The focus has been on doing the project, including mapping, adjudication, and registration, and on developing the necessary capacity for managing the processes within system. The focus has been on the individual landowners, not usually on the wider land administration infrastructure or land policy issues. Institutional issues have been addressed mainly as a response to this more narrow perspective. By using a capacity building approach there should be a focus on building the overall political basis, the infrastructure and human resources necessary for implementing land policy reforms. The case of Malawi is a good example of how these issues can be addressed in an integrated way. This is described in more details in (Enemark&Ahene 2003). Where a donor project is established to create land administration infrastructures in developing or transition countries, it is critical that capacity building is a main steam component that is addressed up front, not as an add-on. In fact, such projects should be dealt with as capacity building projects in themselves for building the institutional capacity to meet the medium and long term needs. The conceptual understanding of capacity building in land administration as presented in this article must be further developed to form an analytical framework of methodological guidelines in this area. Enemark, S. (2001): Land Administration Infrastructures for Sustainable Development. Property Management, Vol. 19, Number 5, pp 366-383. Enemark, S. and Ahene, R. (2003): Capacity Building in Land Management – Implementing Land Policy Reforms in Malawi. Survey Review, Vol. 37, No 287, pp 20-30. Enemark, S. (2002): Strengthening Institutional Capacity in Land Administration - Towards Developing Methodological Guidelines. Proceeding of FAO Workshop, The Land Tenure Service, Rome, 14-15 November 2002. Enemark, S. and Williamson, I.P. (2003): Capacity Building in Land Administration – A Conceptual Approach. Submitted April 2003 for publication in the Journal of Land Use Policy. Groot, Richard and Paul van der Molen, Eds (2000): Workshop on Capacity Building in Land Administration for Developing Countries – Final Report. ITC, Enchede, The Netherlands, 12-15 November 2000. Steudler, D. et. al. (1997): Benchmarking Cadastral Systems. The Australian Surveyor, Vol. 42, No. 3, pp 87-106. UN-ECE (1996): Land Administration Guidelines. UNECE, Geneva. UN-FIG (1999): The Bathurst Declaration on Land Administration for Sustainable Development. FIG Office, Copenhagen. Williamson, I.P. (2001a): Re-engineering Land Administration Systems for Sustainable development – from Rhetoric to reality. International Journal of Applied Earth Observation and Geoinformation, Vol. 3, Issue 3, 278-289. Williamson, I. (2001b): Land Administration “Best Practice” – providing the infrastructure for land policy implementation. Journal for Land Use Policy, Vol. 18, pp. 297-307. Stig Enemark is Head of the School of Surveying and Planning at Aalborg University, Denmark, where he is Professor in Problem Based Learning and Land Management. He is Vice-President of the Danish Association of Chartered Surveyors. He was Chairman of Commission 2 (Professional Education) of the International Federation of Surveyors (FIG) 1994-98. He is an Honorary Member of FIG. His teaching and research interests are in the area of land administration systems, land management and spatial planning. Another research area is within problem-based and project-organised education, and the interaction between education, research and professional practice. He has consulted and published widely within these topics.